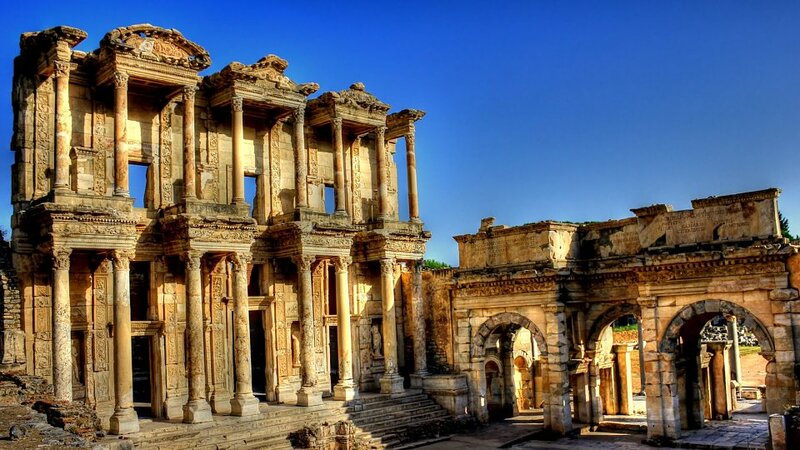 The first of the seven churches to receive a letter from John, Ephesus was the most important city in the Roman province of Asia on the West coast of Asia Minor. The city was located at the mouth of the Cayster River between the mountains and the sea. The harbor underwent extensive clearing during different periods of its history. Silting has left the modern city a little less than 10 miles from the sea. The harbor of Ephesus was an export center at the end of an important land route through Asia Minor.16 Much wealth and trade came to Ephesus through its harbor, which was a main terminus of the sea-route from Italy and Greece. A magnificent road ran through Ephesus to its harbor. It was 25 to 30 feet wide and lined with columns on both sides. The main part of the city contained a theater, a stadium, a library, the agora, baths, and paved streets. Its famous temple, named one of the seven wonders of the world, was originally built for the worship of the Anatolian fertility goddess. It was later identified with the Latin Diana and the Greek Artemis, “whom all Asia and the world worshipped.” (Acts 19:27) Coins bearing the inscription Diana Ephesia validate Luke’s claim. Paul made a short visit to Ephesus on his second missionary journey, where he left Aquila and Priscilla to continue the work (Acts 18:18-21). On his third missionary journey, Paul stayed over two years in Ephesus, making it the center of his missionary activities in Asia (Acts 19:8, 10). In Luke’s account, the great temple is called the Temple of Artemis (RSV) or Temple of Diana (KJ). It contained the image of a goddess that legend said fell from heaven. Paul taught in the marketplace, in the synagogue, or in the lecture hall of Tyrannus, not within the confines of the pagan temple of Artemis that was a little over a mile to the northeast. Paul, who wanted to follow his companions into the theater, was prevented from doing so by some of the disciples: “some of the Asiarchs also, who were friends of his, sent to him and begged him not to venture into the theater” (Acts 19:30- 31). Asiarchs were political figures who held positions of wealth and power. Strabo wrote that Ephesus “is as well peopled as any other city in Asia by people of means; and always some of its men hold the chief places in the province, being called Asiarchs”. Inscriptions attest to Asiarchs in more than 40 cities throughout Asia. Ephesian inscriptions attest to more than 100 Asiarchs in that city alone. For two hours the people in the theater cried with one voice, “Great is Artemis of the Ephesians!” showing their great devotion to the pagan goddess, or to the riches that came from the business of making “silver shrines of Artemis,” which “brought no little business to the craftsmen” (Acts 19:24). The temple of Artemis was the largest building in the Greek world. Ephesus was one of the centers of emperor worship in provincial Asia.21 The first temple of the imperial cult was probably constructed in the reign of Claudius; it was followed by the building of two more, so that Ephesus qualified three times for the title “temple-warden.” The town clerk used this title for the temple of Artemis when he quieted the crowd in the theater: “Who does not know that the city of the Ephesians is temple keeper [temple-warden] of the great Artemis” (Acts 19:35). Acts 18:19-21. Paul visited Ephesus on his second missionary journey. Acts 18:24-19:1. Apollos taught in Ephesus. Acts 19-20; 20:31. Paul spent more than two years in Ephesus on his third missionary journey. 2. Tim. 1:16-18; 4:19. Paul praised the kindness of Onesiphorus, a Christian from Ephesus who was loyal to him and to the Church. 2 Tim. 4:14-15. Paul wrote Timothy that he was opposed by “Alexander the coppersmith” while preaching the gospel in Ephesus. 1 Tim. 1:3. Timothy stayed in Ephesus when Paul left for Macedonia. Timothy was probably in Ephesus when he received Paul’s letter.